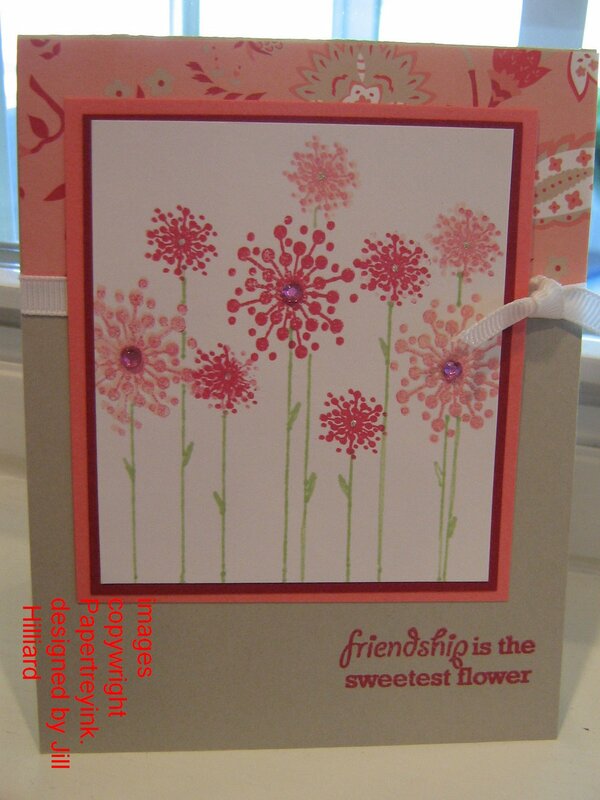 This is a card I made for a Green Thumb swap on SCS. Green Thumb is a recent stamp set from Papertreyink.com . I used SU Sahara sand, cameo coral and rose red card stock. I do not have a Cameo coral ink pad so I made do with a blend of blush blossom mixed with a “stamped off” rose red. In real life its a really good match. I hand drew the stems with a certainly celery marker. The patterned paper is from a DCWV stack from my stash and the *Bling* on the few larger flowers– can you believe is from the dollar store and are peel and stick. I really like them. The design for this card is a combo of many cards on SCS. Enjoy! Love the card–great colors and the bling is perfect!Just got my green thumb set today–already played with it some–what fun! Love the site!! too cute – love it more in person – the pic is good but up close this is STUNNING! 🙂 Lucky person who gets this in the swap! TFS!